The symbol of a hand pouring water from a jug or pitcher into a bowl is the symbol of the Levites one of the 12 tribes of Israel. 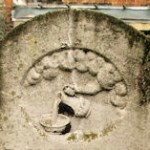 Levites were responsible for cleaning the hands of the Temple Priest or Cohen and this is what the symbol is depicting. 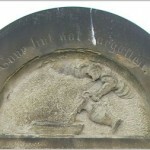 A tombstone with this symbol shows that the deceased was a Levi.